1. Can the Trends Audio TA-10.1 be bridges so that one amp is used for each channel? If you want to use two TA 10.1 you need biwireable speakers so you can connect one TA 10.1 per speaker or one to the bass range posts and one to the high range posts (vertical or horizontal bi-amping). This way power output and overall dynamics will increase. Don't forget you can bypass the volume pot via an internal jumper (so the TA 10.1 becomes a pure power amp by all means). 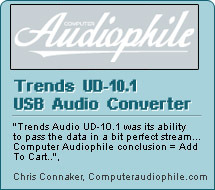 Or you can consider Trends BA-10 Bi-amp Audio System and download this document for more details. 2. Which speakers do you recommend with the Trends TA-10 amp. ? There are various of speakers suitable for Trends TA-10 no matter bookshelf or floor stand speakers. But, since the output power of Trends TA-10 is only 2x15W, it'd better to choose some higher sensitivity speakers, e.g. >87dB. For the impendence, from 4 ohm to 16 ohm is ok. But, 6-8 ohm would be a little bit better. 3. Can I connect my subwoofer to the speaker terminals of this amp ? Yes, you can connect your passive subwoofer to TA-10 as 2.1 channels in the following conventions: besides the left & right channels connected, connect the +ve of subwoofer to TA-10's left +ve terminal and -ve of subwoofer to TA-10's right -ve terminal. But, it is highly recommended to match the speaker’s impedance such that the subwoofer is about half the impedance of the left/right speakers, e.g. 4ohm subwoofer & 8ohm L/R speakers. 4. Can I use an AC adaptor 13,8V 7A for two Trends TA-10 amps ? It is ok to use an adaptor 13.8V 7A for two TA-10. But, two 13.8V 3.5A should be better (less interference). Beware that the voltage is too high. It is not recommend using power supply up to 14V. So, you should ensure your supply is 13.8V (not higher actually). 5. What is the input impedance of the Trends TA-10 amplifier? The input impedance of the Trends TA-10 amplifier is about 50k ohm. 6. What is the frequency response of Trends TA-10 amplifiers? The frequency response is 22 Hz - 22k Hz. 7. I have a device that has RCA audio output. (i.e.Squeezebox3). I can choose to set the output to line level or variable controlled by the volume control on this device (i.e. Squeezebox). I would like a simple amplifier that will power the speakers, using the device (i.e. Squeezebox) for audio and volume control. I would also like the amp to turn off or at least not send power to the speakers when there is no input from the device. Which Trends TA-10 amp do I order? It is Trends TA-10.2P Class-T Power Amplifier. If you want to use the volume control of the device (i.e.Squeezebox3), you just need the TA-10.2P (w/o volume control) pure power amp. and set the device's RCA audio output as variable controlled. Then, simply connect the device and Trends TA-10.2P Class-T Power Amplifier with a RCA audio cable. 8. Is the TA-10.2 direct coupled amp. ? 9. In my other set-ups for Subwoofer connection, I have use the speak level output from an amplifier to provide a signal to an active sub-woofer that accepts both speaker level and line-level inputs. Can I do the same with the TA-10.2 Class-T amp. outputs? No, Trends TA-10.2 can accept line level input only !. 10. I wanted to use my Trends Audio TA 10.1 as power amp (with a pre amplifier). What is the input impedance and input sensitivity for Trends TA-10 amplifier? Just simply configure your existing Trends TA-10 Class-T Stereo Audio as a pure power amp (no volume control function) by resetting the jumpers in J2(Refer to user manual). The input impedance of the Trends TA-10 amplifier is about 50k ohm. 11. I would like to know if the supplied power supply is switching or linear PSU. The bundled AC adaptor is switching power supply. 12. Is it possible to connect a powered active subwoofer and passive bookshelves to one TA-10.2? In most cases, the active subwoofer should have audio in and audio out sockets. However, just connect the audio source (e.g. CD Player) to the active subwoofer and connect the output of the subwoofer to the TA-10.2. 13. Does Trends amp has 1 shared common ground or 2 independent grounds from the speaker taps? The Outputs of Trends TA10.2 are NOT common grounded.